Mountain Family Health Centers and partner organizations celebrated the grand opening of our new Basalt Integrated Health Center earlier this month. On Monday, January 7th, Mountain Family leadership and staff cut a ceremonial ribbon and officially welcomed the community to our newest location with medical, dental, and behavioral health services offered under one roof. Click here to see a photo gallery of the grand opening. The Basalt Integrated Health Center will allow Mountain Family to significantly increase the number of patients receiving care in the Roaring Fork Valley, from 2,200 to 3,700. 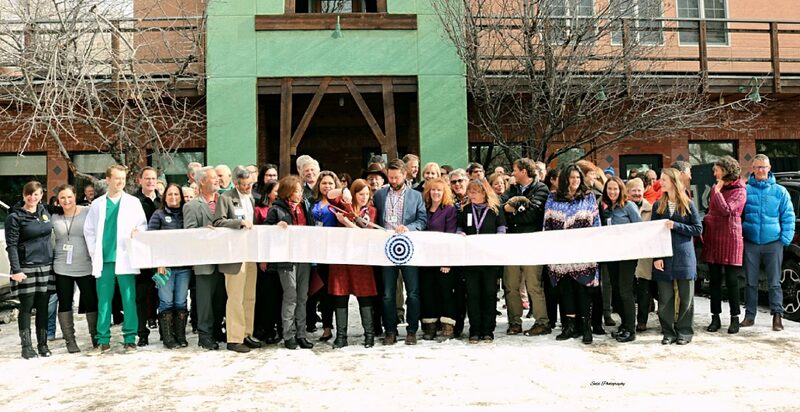 Essential partners for the Basalt Integrated Health Center are Aspen Valley Hospital, Pitkin County, The Colorado Health Foundation, the Colorado Health Access Fund with The Denver Foundation, the Gates Family Foundation, the Caring for Community Fund (Aspen Skiing Company), the Alpenglow Foundation, the Caring for Colorado Foundation, and Eagle County. Support from a variety of organizations and governments are critical for funding the new location, including the Rose Foundation, the Betty Jane Schuss and Donor Advised Funds at the Aspen Community Foundation, Robert Pew, Gates Family Foundation, El Pomar Foundation, The Colorado Department of Public Health and the Environment, the Health Resources & Services Administration (HRSA), the Town of Snowmass Village and the Aspen Thrift Shop. “One of the ways Aspen Skiing Company has supported the Basalt Integrated Health Center is through our Caring for Community Fund,” said Mike Kaplan, Aspen Skiing Company CEO. Ski Co employees donate to the fund and decide how to distribute funding, with Ski Co matching contributions on a 2:1 basis. “I am happy to announce Mountain Family has met the challenge,” continued Mike on Monday, “raising more than $100,000 in matching funding for the Building Health for All campaign.” More than $13,000 was raised on Colorado Gives Day last month to help meet that goal. The matching grant made for the Building Health for All campaign for the Basalt Integrated Health Center is the largest grant made to date for the Caring for Community Fund. Mountain Family deeply appreciated the participation and thoughtful remarks by a long list of community partners, including Pitkin County Board of Commissioners Chair Patty Clapper, Pitkin County Manager Jon Peacock, Pitkin County Public Health Director Karen Koenemann, Pitkin County Director of Human Services Nan Sundeen, Aspen Valley Hospital CEO David Ressler, Eagle County Manager Jeff Shroll, Eagle County Commissioner Jeanne McQueeney, Town of Basalt Mayor Jacque Whitsitt, Carbondale Town Trustee Lani Kitching. Speakers also included Mountain Family Board of Directors Vice Chair Rob Stein and board members Haidith Ramirez, Richard Gonzales and Samuel Bernal, as well as Mountain Family Edwards and Glenwood Springs Site Medical Director Jenny Lang, FNP, and Basalt Medical Director Dr. Anneliese Heckert. Individual donors are crucial to the success of the Building Health for All: the Basalt Integrated Health Center Campaign. Generous donors include Cliff & Sandy Deveny, Rob Stein & Mariah Dickson, Ross & Lindsey Brooks, Annette Franta, Tim Burns & Jenny Lang, Jon & Julie Fox-Rubin, Robert Pew, Blanca O’Leary, George & Patty Stranahan, Matthew Hamilton, Richard Gonzales, Linda Brodin, Jerome Evans, Paulette Dangler, Dr. Anneliese Heckert, Dr. Matt Percy, Garry Schalla, and Roger & Deborah Garrett. To provide high quality, integrated primary medical, behavioral, and dental health care in the communities we serve, with special consideration for the medically underserved, regardless of ability to pay.